Dubai: Dubai has ring-fenced prized assets such as the Emirates airline from the $26 billion (Rs1.2 trillion) debt restructuring of Dubai World, denting fragile investor sentiment ahead of talks between the state conglomerate and key creditors. The firm that spearheaded Dubai’s growth is set to meet with its main bank creditors later on Monday to discuss a request to delay repayments that has shaken global markets and damaged the reputation of the Gulf Arab business hub. London-listed Standard Chartered, HSBC, Lloyds and Royal Bank of Scotland will attend the creditors’ meeting, along with United Arab Emirates lenders Abu Dhabi Commercial Bank and Emirates NBD, an Abu Dhabi bank executive said last week. But Dubai’s finance chief said that while Dubai World might sell some assets to finance its commitments, the government, which borrowed to transform the emirate from a desert backwater into a major trading and tourism centre, would not make any disposals of its own. Abdul Rahman al-Saleh emphasized that Dubai government and Dubai World were not the same, suggesting the emirate’s most valuable firms such as Emirates, Dubai Aluminium or its 21% London Stock Exchange stake would not be involved in a firesale. His comments sent the Dubai bourse tumbling almost 6% to a 20-week low, reversing gains made on Sunday. DP World, Dubai World’s flagship port operator, fell 5.5%. “There is confusion in the media that the government plans to sell assets," al-Saleh said in an interview with Al Jazeera television. “The company has foreign investments and real estate investments abroad. There is nothing to prevent selling these assets." The emirate’s overall assets could be worth as much as two-four times their debts, according to analysts. Moody’s estimates Dubai debt at about $100 billion. But quite what Dubai World could sell remains unclear. 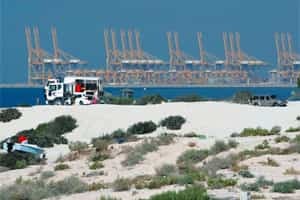 The struggling group shed some light on 30 November on how it planned to restructure the $26 billion debt pile, including through asset sales, but said Istithmar World, DP World and Jebel Ali Free Zone would not be included. Istithmar’s portfolio ranges from US high-end retailer Barneys to the luxury W Hotel in Washington, DC, as well as sought-after property in London including 10, Whitehall Place. Infinity World, another unit exempt from the plans, is a stakeholder in MGM Mirage. The cost of insuring Dubai’s debt against restructuring or default rose on Monday to 496 from 485.5 points. The $3.5 billion sukuk bond for Nakheel, maturing this month, one of the issues to be restructured, fell 1 point to 53 points, while property stocks were all trading limit down. “(The market) did not react well to the Dubai government news, which again cast a cloud of doubt," said Ayman el-Saheb, Darahem Financial Brokerage’s director of operations. Since Dubai World requested a payment standstill on 25 November, regional government officials and bankers have looked to downplay its impact. Bahrain’s central bank governor joined the chorus on Monday, saying exposure to Dubai World was limited to $281 million. Deutsche Bank’s West Asia head Henry Azzam said the lender did not have any exposure, and that he did not expect a major impact on the region’s banking sector. Qatar’s Prime Minister Sheikh Hamad bin Jassim al-Thani, whose country is a major gas exporter and an active global investor, said the media had exaggerated Dubai’s debt problems. “It is normal for such things (debt problems) to happen during the global crisis," he said in remarks carried by country’s state news agency. “Therefore things should not be given connotations beyond what they bear." Matt Smith, Frederik Richter, Stanley Carvalho, Rania Oteify, Rachna Uppal and Jason Benham contributed to this story.